1 Place the butter in a 250ml tea cup or small mug and microwave for 1–20 seconds until melted. 2 Add the caster sugar, brown sugar and cocoa powder and beat with a fork until thoroughly combined. 3 Add the egg yolk and vanilla and beat together, then add the flour and salt and beat again until thoroughly combined and smooth. 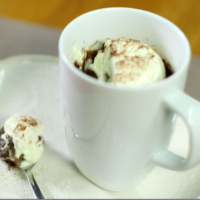 Stir through half the chocolate chips and transfer to a 250ml paper cup, if using. 4 Cook in the microwave for 50 seconds @ 600W, 30 seconds @ 800W or 25 seconds @ 1000W. Scatter the remaining chocolate chips over the top and cook in the microwave for a further 30 seconds. Leave to cool for about 15 minutes (if you can bear to wait) as then the cake becomes deliciously chewy and is ready to serve. Mug Cakes by Mima Sinclair, published by Kyle Books, priced £8.99. Text © Mima Sinclair. Photography © Tara Fisher. This recipe was first published in Thu Nov 06 10:11:54 GMT 2014.